Mr Alf Hannaford was an outstanding agricultural pioneer. No individual has devoted as much time and energy or has been so tenaciously dedicated to better cereal crops through seed grading, and the protection of crops by controlling cereal diseases and infestations through seed treatment. Mr Alf Hannaford's inventions and machinery developments, which simplified those processes, are a memorial to his life's work. Mr Hannaford was farming at Riverton, South Australia, when caught in the infamous drought of 1914 and its effect on crops vital to the war effort. This disappointing harvest and his own realisation that there was room for much improvement in the methods of pickling wheat awakened within him a fervent purpose that changed the course of his life and eventually altered the traditional cereal farming methods of those around him and beyond. His first invention - The Hannaford Wet Wheat Pickler - was a great success and spurred him on to consider inventing a seed grading machine and a dry pickling method. He gave up farming and became an inventor and manufacturer. In the early twenties 'The Hannaford Ideal Dry Pickler' appeared on the market and was an instant success. This was quickly followed by the 'Ideal Combined Grader and Dry Pickler', the first of its type on the market. Farmers saw the common sense in grading for plump, virile seed and in pickling to prevent disease and infestation. This growing demand for Alf Hannaford machines warranted capital and expansion. On 13 August 1925, the newly formed Alf Hannaford & Company Limited took over the business of Alf Hannaford & Company, which formerly had been conducted by Mr and Mrs Hannaford. Mr Alf Hannaford was appointed Managing Director of the new company. Demand and expansion repeated themselves. New machines were manufactured and more factory space was acquired to keep pace with this growing industry and to accommodate the research branch, which projected the Company into new areas of invention and improvement. In 1927, the old wooden-framed grader and dry pickler was converted to a steel-bodied machine to give it longer life. In 1928, the Company obtained the Australian rights of the Carter Separator Pocket Disc with shrewd foresight of visualising the incorporation of this disc with their own grading machines. 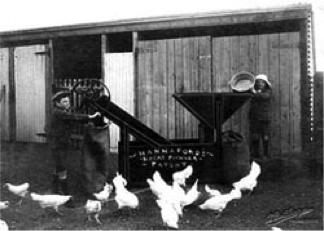 Several machines were developed, and the farm type junior wheat graders, separators and dry picklers were placed on the market, and these continued the Hannaford success story. 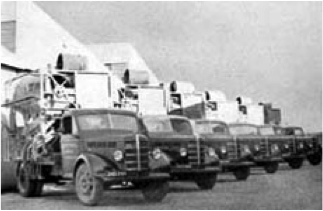 From New South Wales came the request for larger machines to be mounted on motor trucks for easier transportation between farms. The Model K was designed specifically to meet this requirement. Early 1929, the depression impoverished the farming communities and very few could afford to purchase machinery outright and hire purchase finance, which formerly facilitated most sales, became very tight. The management conceived the idea of hiring-out a machine with a trained operator to treat the grain on the farm, charging only for the service. The response to this service exceeded the Company's expectations; it treated 60,000 bags in that first trial year of 1930 and twenty years later rose to 3,250,000 bags, spread over 16,000 farms. By July 1932, the Company had survived the depression and secured its future. Again, there was a need for expansion. The Company purchased property on nearby Port Road, using the old workshops in Kemp Street, Woodville, for the new venture of making breakfast foods. 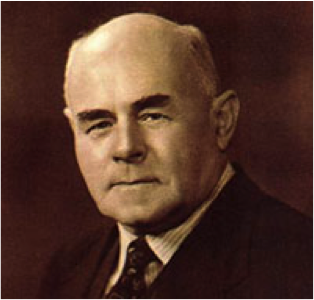 In August, 1936, when one of the founding Directors, W.R. Swann, retired, Hedley Hannaford (the elder son of the founder), was appointed to fill the vacancy. Meanwhile, since 1933, the business had been operating in Western Australia and was registered in that State in February, 1935. Likewise in Victoria, the business developed and was registered in that State in 1937. Property was obtained at Dimboola and at one time was managed by Murray Hannaford, the second son of Alf. The wartime demand for cereals meant expansion under the severe handicap of labour shortage because of staff enlistment, and the Company had to abandon its involvement with the cleaning of subterranean clover. However, a new legume, commercialised as barrel medic was, and still is, cleaned by Company designed machines. For the part played by Alf in the development of this legume, it was given the name 'Hannaford' barrel medic. World War II saw some other interesting developments. In 1940, the Flax Production Committee asked the Company to grade and distribute the seed for this crop. Special machines were designed and manufactured at Woodville. The Field Peas Board also summoned help and the Managing Director designed a specific gravity grader, which resulted in better handling of peas. The Vegetable Seeds Committee called on the Company's service, which graded all seeds grown in South Australia. The British Government ordered Hannaford Dry Picklers; one was shipped in February 1942 but was lost by enemy action. A repeat order was shipped successfully in July of the same year. In 1947, a property was purchased in Belmont, Western Australia, to unite both office and workshop of the Western Australian branch under one roof. As part of the Silver Jubilee Celebrations of the Company, Mr Alf Hannaford officially declared the premises open on June 23, 1950 - by happy coincidence, his 60th birthday. There followed 25 years of successful business with no major structural changes until August 1976 when the Company shares were purchased by Crompton and Sons (South Aust.) Pty Ltd, a subsidiary of Crompton & Sons Pty Ltd, now Crompton Group Holdings Pty Ltd. There was a fresh surge of growth. A new factory complex was built at Beverley in 1978, and in October of that year the Western Australian Office was transferred from Perth to Northam. The Company established Hannaford Macquarie Valley Pty Ltd with a 98% interest and Goondiwindi Grain Cleaners Pty Ltd, with a 50% holding, along with expanding the seed grading business in New South Wales, Victoria and Queensland. Hannaford has delivered a mobile seed grading and treating service to Australian broadacre cereal and legume growers for more than 85 years. The company name was changed to Hannaford Seedmaster Services (Australia) Pty Ltd in September 1985. In the same year the company carried out an extensive review of its business and found a changing rural environment needed a modern approach to market. As a result of this review, Hannaford launched the first rural agricultural services franchise effectively creating over 60 new local rural businesses over the next five years. Today, the Hannaford franchised business has operations Australia wide. These professional on farm seed management specialists carry an exclusive range of quality seed treatments that have been specially formulated for professional application to ensure greater efficiency and efficacy to aid the production of better crops. The Hannaford franchised operation is committed to delivering the highest quality seed management service in Australia, striving to develop machinery that selects only the highest quality of seed in the quest to help growers grow bigger and better crops.